I Can Explain: Dwayne Johnson: Hollywood's Next Big Thing? Is Dwayne "The Rock" Johnson a bankable star? I have noticed that a number of the people who read my "The Big Winners (and Losers) of 2012 in Film" entry asked why Johnson was on the list. Did he really have a good year? Is he a bankable star? Is he really a more bankable star than the likes of Chris Hemsworth, Kristen Stewart, Jeremy Renner, Robert Pattinson, Natalie Portman, Julia Roberts, etc.? And, I have to be honest, but I think he is. Johnson is likable, intelligent, charismatic, a big name, and in my opinion, a good actor. A lot of people just did not feel Johnson should have been on the list. Most were surprised. They understood why Emma Stone or Channing Tatum were on there, but when Johnson's name popped up they did not understand why. When I first made the list I asked myself why was I putting him on that list. I asked that again when people began questioning my choice of Johnson on my lists of the big winners of 2012. Was it because I was a big wrestling fan during my childhood? Maybe that's why I thought Johnson was popular because I grew up watching The Rock wrestle every Monday and Thursday night. But, after looking over the box office numbers, I began to realize that was not the case. The numbers in my opinion show that Johnson is on the brink of being one of the most bankable names in Hollywood, which in turn would make him one of the biggest names in the industry. 2012 was a year that pushed him towards that. Let me first bring up the Forbes' most bankable list that I mentioned in my previous entry. What the magazine did was they showed how much money an actor's movies made for every dollar they were paid. The top five names on the list were: Natalie Portman, Kristen Stewart, Shia LaBeouf, and Daniel Radcliffe. Now, they define bankable as how much money the actor brings for every dollar they are paid, but I do not see that the definition of bankable in Hollywood. I consider a bankable star as an actor who can churn out movies that consistently make money. Will Smith is the biggest bankable star in the industry today in my opinion. Thirteen of Smith's twenty films have grossed over $100 million in the U.S. alone (BoxOfficeMojo). That is a bankable star in my opinion. Now let's take a look at the person who was number eight on that Forbes list, Dwayne Johnson. Yes, Dwayne Johnson was on Forbes' list of most bankable stars in Hollywood. See, I'm not crazy! Johnson's movies reportedly bring back $22.70 for every $1 he is paid. Johnson starred or appeared in six movies between 2010-2011. Granted, a few of them were cameo appearances. For example, Johnson was not the box office draw for The Other Guys, but he was hysterical in it. He had starring roles in films such as The Tooth Fairy, Faster, Fast Five, and Journey 2: The Mysterious Island from 2010-2012. Most of Johnson's movies have made profit. Now, there have been a few, but when looking at the numbers I have never seen a box office bomb like John Carter or something of that nature. Johnson is consistent when it comes to box office grosses. Dwayne Johnson has starred in 15 films that were given wide releases. Only five of them did not make the film's budget back. However, four of those five that lost money were released in 2006 or before. The only one that did not do too well recently was Faster. The movie that lost the most money was Doom, which only lost $40 million. I say "only" because it could have been a lot worse. One of his films that lost money was The Rundown, which by the way, is a really great film in my opinion and still made $83 million worldwide (not too bad). It is not a classic or anything, but it is funny, has some good action moments, good performances, and a decent story. It might seem like Johnson has not been that successful at the box office, but in reality he has been consistently starring in profitable films. Even the biggest stars have some hiccups. I mean come on The Legend of Bagger Vance anyone? Now, there is one more important thing I want to bring up about Johnson. Johnson is a versatile actor. I think he is a really good actor, even though I do not think we have seen all of his abilities yet. Johnson is the action star, Johnson is the comedian, Johnson is the family star, and I think Johnson can play the dramatic actor. Early in his career, people compared him to actors like Schwarzenegger and Stallone. He was basically considered a bonafide action star right out of the gate with films like The Scorpion King and The Rundown. I personally feel Johnson is a more versatile actor than those two and many of the other older action stars. And, this is not going unnoticed by the critics. 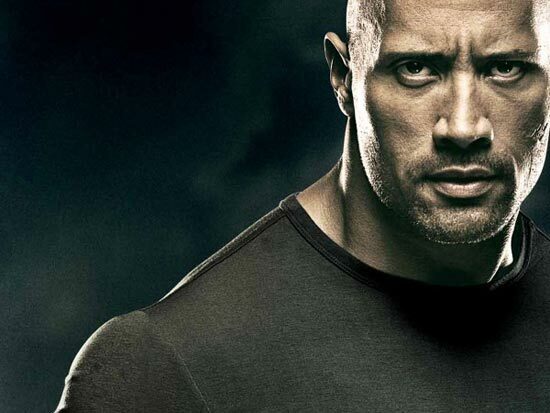 Fast Five is a great example of what critics think of Dwayne Johnson. For his review in the popular British film magazine Empire, film critic Nick de Semlyen started his review of Fast Five by saying, "How [do you] re-ignite an aging franchise? Drop The Rock on it. The best thing, by far, in Fast Five"(de Semlyen). Film critic Bruce Diones for the famed American magazine The New Yorker criticized the film's length and the performances of some of the actors like Vin Diesel and Paul Walker. However, Diones would close his review by saying, "Dwayne Johnson...brings a hip, comic knowingness to his role...his enjoyment is infectious and keeps the movie speeding along" (Diones). That was just two reviews from Johnson's Fast Five. There are over 180 reviews for the film according to RottenTomatoes.com and Fast Five received the most critical praise than any other film in the series. I think Johnson had something to do with that. Even the people like Diones, who had negative comments for portions of the film, still gave Johnson praise for his charisma and presence on screen. In one of Johnson's recently less favorable films with the critics, Journey 2: The Mysterious Island, he still received favorable praise from critics. Famed critic Roger Ebert stated that the film "isn't a 'good' movie in the usual sense (or most sense), but it is jolly and good-natured, and Michael Caine and Dwayne Johnson are among the most likable of actors" (Ebert). Johnson's star power is climbing and he is becoming a major box office draw within the industry. I know some do not realize that because Johnson has not had numerous big-budget films released within a calendar year like Channing Tatum or Joseph Gordon-Levitt, but he is having good years when he is releasing profitable movies each year like in 2012. He has hit all of the demographics almost. He has the family audiences with films like Journey 2: The Mysterious Island and The Game Plan. Then he has the more adult audiences with films like Fast Five and The Rundown. Now, like I said Johnson has had successful years and big years, but he hasn't had that BIG year that an upcoming actor needs. Not yet at least. 2013 I believe will be the Year of the Rock. Dwayne Johnson will have starring roles in five films next year. Not just that, Johnson will have a movie released every month between February and May. In February, Johnson will be starring in Snitch, an action thriller where Johnson becomes an undercover informant against the drug cartel in order to protect his family. In March, Johnson will be taking the reigns of the G.I. Joe franchise with Bruce Willis and the returning Channing Tatum in G.I. Joe: Retaliation. In April, Johnson will team-up with Mark Wahlberg in the Michael Bay directed film Pain & Gain. In May, Johnson will reprise his role of Agent Luke Hobbs in Fast Six. Also, he will be appearing on WWE television in January because he will be wrestling at WWE's Royal Rumble pay-per-view where he will be competing for the WWE Championship. Now, you might not like wrestling, but it could definitely help Johnson's movies by appearing on television numerous times right before his four-month run at the theatres. Johnson is becoming a bankable star and he did have a big year last year. The moviegoers have proved that. The critics have proved it. He is already becoming a household name. If I ask a variety, and I mean a variety, of people who The Rock or Dwayne Johnson is, almost all of them can tell me. If I ask them who Jeremy Renner or Sam Worthington, they answer, "Who?". Then I go on and tell them what movies they have been in and that usually helps. The Rock isn't like that. Majority of people know him by name, even though they may not like some of his movies. Johnson is at a time in his career where it seems like every year is a big year for him, even if he only releases a movie like Journey 2: The Mysterious Island. Now, let's just sit back and watch The Rock become Hollywood's Go-To Guy. 2012 was just the prelude in my opinion. 2013 will be the main event (You see what I did there?). And, if you want to know more about how popular, charismatic, entertaining, and funny Dwayne Johnson is then just take a look at the video below. You don't have to watch the whole thing. But, at least start watching at the one-minute mark and try to watch up until the nine-minute mark. You get and idea of who he is. And I watched wrestling for a number of years and I've never, and I mean never, heard an ovation like that before in my life. Or for that long now that I think about it.